In the late 1970s, DARPA (Defense Advanced Research Projects Agency) began the SIAM (Self-Initiated Anti-Aircraft Missile) program to develop a completely autonomous air-defense missile. In January 1979, Ford Aerospace was awarded a contract to build and flight test SIAM prototype missiles. The SIAM was powered by a solid-fueled rocket motor and had a diameter of 11.4 cm (4.5 in). It was equipped with a dual-mode (radar/IR) seeker, which could automatically search, track and lock on targets when the missile was located in its launcher on the ground. Once locked on a target, the missile could launch without any input from an operator. 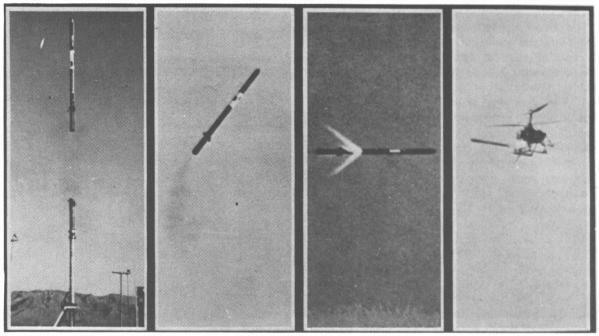 There were several possible modes of employment for SIAM-type missiles. It could be emplaced like a "mine" around enemy airfields to shoot down any aircraft operating from that field, or be used to provide automatic air-defense for own assets like ships. Source  mentions possible use as an airfield defense weapon, but one wonders about the necessary 100% reliable IFF system for that to work! However, the most important application for SIAM would have been that of a submarine-based anti-aircraft missile. In that role SIAM was also known as SUBADS (Submarine Air-Defense System). It was known that submerged submarines can detect approaching aircraft, because the latter's sound is propagated through the water. The sub could then send a SIAM-equipped buoy to the surface, where the missile would automatically detect and destroy the incoming aircraft. Direct vertical launch of the SIAM from the submarine was also considered. The SIAM flight tests from ground-based launchers were conducted in the 1980/81 time frame and were generally successful. In one test the missile autonomously detected and shot down an approaching QH-50 drone helicopter. DARPA planned to hand SIAM development to the U.S. Navy after the completion of the demonstration program. However, the Navy didn't pursue the program, presumably because of lack of funding. I have no details about the physical characteristics of the SIAM missile.